It’s important for retired history teacher Barbara Calloway that her children and grandchildren realize the impact of Salem Township’s Fairview Park on her own family and a generation of area African-Americans. “They really can’t imagine the whole segregation thing. It’s part of our integrity, our history and part of who we are,” she said. The park was selected earlier this month to be on the National Register of Historic Places. It was developed in 1945 by the Monongahela Valley Sunday School Association — a group of African-American churches from Westmoreland and Allegheny counties. At a time when segregation restricted access to other public amusement parks, Fairview Park was a place the African-American community could call its own. “The designation is a recognition of what the people who founded the land had to go through,” Fairview Park Association president Ernest Jackson said. The idea for a safe, welcoming place for African-American families, many from urban communities, to have fun and fellowship was actually conceived in 1918, Mr. Jackson said. “No banks were lending money for land to black folks at that time,” he said. A banker himself, Mr. Jackson is vice president of operations for Dollar Bank. People put up their own cash, even mortgaged their homes to develop the 100 acres of land where a roadside gas station and restaurant once stood along Route 22. “It wasn’t an easy transaction,” Mr. Jackson said. By the 1940s and 1950s, the park established itself as the first African-American-owned amusement park and the place to go for church picnics and other gatherings. In its heyday, it featured a roller coaster and merry-go-round for small children, a swimming pool, softball fields, playground equipment, petting zoo and even hot air balloon rides. “We took our picnic baskets and visited. The church picnic was the highlight of the year,” said Mrs. Calloway, of Point Breeze. Most churches had buses to transport those without cars to the Westmoreland County park. “If you trace the history of the Civil Rights movement, you could determine when the park was most popular,” Mr. Jackson said. Attendance started to decline in the late 1960s with the Civil Rights movement. As money was needed throughout the park’s history, parts of the land were sold, including 33 plots that created the first black community in Salem Township. Part of the land was sold to pay real estate taxes — a cost that should have never occurred, Mr. Jackson said. Because the proper paperwork had not been filed, tax-exempt, non-profit status wasn’t official until 1998. Now the association’s goal is to develop the park, which is still functional and used by a variety of groups. Costs for maintaining the existing 52 acres come entirely from donations, mainly from the dozen or so churches actively involved in the association. Volunteers cut the grass and do repair work. But significant funding is required to meet the park association’s short term plans for updating the existing three shelters and bathroom facilities, playground equipment and ball field. The group is hoping to find someone to offer expertise in grant writing, Mr. Jackson said. Along with its new national historical status, the park is eligible for consideration in federally assisted projects and qualifies for federal grants for historical preservation when funds are available, according to the website for the National Register of Historic Places: www.nps.gov/nr. The association has a dream of further developing the park into a retreat center, providing facilities for church groups and businesses. “With over 50 acres of land, there are many things we could do,” Mr. Jackson said. But for now, as in the early days, church picnics successfully prevail, introducing today’s children to old-fashioned traditions like sack races, baking contests and bingo. “They are things that kids don’t do now, but once they catch on, it gets competitive,” Mr. Jackson said. A Westmoreland County park with roots deep in African-American history has been listed on the National Register of Historic Places and named a historic landmark by the Pennsylvania Historical and Museum Commission. 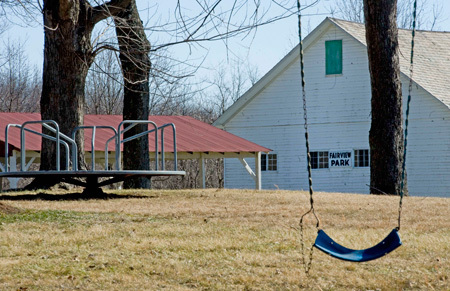 Fairview Park in Salem Township, near Delmont, was created in 1945 in response to mostly or exclusively whites-only amusement parks throughout Western Pennsylvania. The segregationist era began to crumble in the 1960s, and the amusement rides and other attractions at the park eventually were dismantled. Today, Fairview Park consists of aging swings sets and slides, a basketball court, a ball field and several picnic pavilions. Ernest Jackson, president of the Fairview Park Association, said the state and federal designations were intended foremost to “honor the memory” of the men and women who founded the park and of the wonderful times the park made possible. Originally organized by a coalition of black churches in Pittsburgh, Fairview Park hosted large gatherings until sometime in the 1970s, Jackson said. The founders had “foresight and vision,” said Jackson, of the South Hills. “Fairview Park enabled a lot of people, including a lot of young people, to get out of the inner city and spend time in the country,” he said. He said photographs from the late 1970s show row after row of buses jammed with fun-seekers pulling up to the park entrance. At the height of its popularity, the park featured a roller-coaster, merry-go-round, skating rink and swimming pool. At 52 acres, today’s park is nearly half the size it once was. It is maintained by a small group of volunteers, Jackson said. Each summer, the Fairview Park Association holds an annual Old-Fashioned Picnic at the park with a petting zoo and other amusements. The event is open to all, Jackson said. The de facto segregation of blacks was a way of life in the northern United States during most of the 20th century. Blacks in Western Pennsylvania were routinely barred from public facilities such as movie theaters and swimming pools. All of this was in contrast to the Jim Crow segregation — mandated by state and local laws — practiced in the South. Carol Lee, the state’s national register and survey coordinator, said Fairview Park is the only black amusement park in the state. “At least it’s the only one we know of,” she said. That makes Fairview Park significant in the commission’s eyes, Lee said. The state and federal actions recognizing the park were wrapped up in December, Lee said. The review process took about 18 months. “Basically, it’s a matter of having bragging rights,” Lee said of the designation as a state and federal historical treasure. There are no bars to private development of the property, she said. At one time, the park association was looking forward to the construction of a multimillion-dollar, assisted-care living facility on the property. Jackson indicated that no project is planned, though he holds out hope the park’s enhanced status will stimulate interest in the park’s history and possibly development. Bricks and mortar rained onto 21st Street Monday morning, the likely result of water damage to the side of the S&S Candy and Cigar Co. at 2025 E. Carson St. on the South Side. An almost identical incident occurred in the morning when bricks fell from the side of a dentist’s office in Washington, Pa., damaging four cars. Bob Farrow, division chief of Pittsburgh’s EMS department, said the outer layer of bricks on the S&S building gave out, followed by a crashing down of older bricks and mortar behind it. The owner was not available to discuss the damage, but acting Bureau of Building Inspection Chief John Jennings said he suspected that water got in behind the veneer of bricks and pushed them out. “We have seen this before, where water seeps in behind the brick, freezes and pushes the bricks out,” he said. Police closed South 21st Street between East Carson and Sidney streets. The parking lane alongside the candy store was covered with rubble. Dozens of bystanders stared as the outer layer that had not fallen hung peeled back like a rind. The candy and tobacco store has been in business in Pittsburgh since 1965. In Washington, the brick facade of the dentist’s office detached without warning onto a side street, crushing four cars in the building’s parking lot. Strong winds are being blamed for the collapse, according to what building owner Thomas C. Drewitz heard from insurers. Emergency workers cordoned off the two-story building in the 800 block of Jefferson Avenue after the 10:40 a.m. incident. 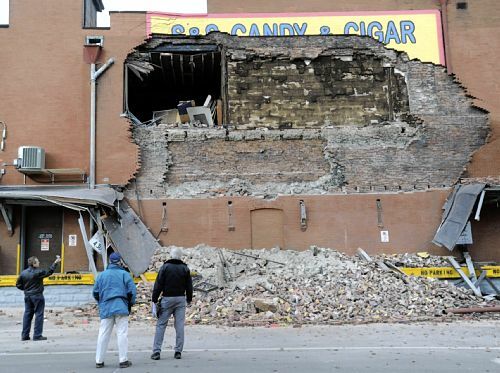 The city issued an emergency demolition permit to remove any loose bricks that had not fallen. Dr. Drewitz said the building was constructed around 1965. Three cars were totaled and a fourth suffered heavy damage. “They were flat,” fire Capt. Nick Blumer said of the vehicles. Dr. Drewitz closed the office for the day but said he planned to reopen today. Francine Mykich was preparing S&S Candy and Cigar Co. for its busiest day of the week when she thought she heard a truck hit the South Side store. A wall of the building, which dates to 1892, collapsed onto 21st Street about 8:40 a.m. Rubble covered the sidewalk and part of the street. All the employees safely evacuated the building, and no one was injured. The collapse likely was caused by moisture freezing between layers of brick and breaking the bonds between them, said John Jennings, the city’s interim building inspection director. When the bricks thaw, there’s nothing left holding them together, he said. The owner of the building, identified in property records as Richard Stephens, has to get an engineer to stabilize the building before clean-up begins, Jennings said. Bricks and pieces of the building continued to fall throughout the morning. Through employees, Stephens declined to comment. It could take a day or more to stabilize the building, Jennings said. The building is part of the East Carson Historic District. It first appeared as Armour & Company Wholesale Meats in 1892, said Frank Stroker, assistant archivist with Pittsburgh History & Landmarks Foundation. 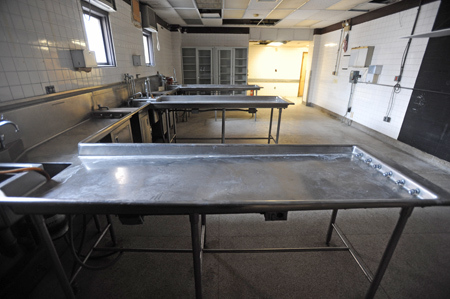 “It was probably their main facility at that point,” Stroker said. Armour held the location until 1952. The building then briefly became home of Freezer Foods Inc., Stroker said. By 1956, Brinn’s China and Glassware moved in, he said, and held the spot until S&S took over in 1965. City officials would have to approve any demolition, alterations or repairs because of its location in the historic district, said John Martine, an architect and member of the local advisory committee to the city’s Historic Review Commission. Martine said he’s always admired a canopy along the side of the building. The collapse destroyed the canopy. Saxonburg’s Main Street program manager says he’s feeling “pretty blessed” by the news last month that the Pennsylvania Department of Transportation had come through with a $1.4 million grant. The money was both needed and expected. But, Raymond Rush said he was happy it was all official. “We’ve been blessed by PennDOT and beyond,” he said. Design and engineering work is under way for reconstruction of both sides of Main Street — a four-block section of the street that spans about 2,200 feet from Butler Street to Rebecca Street. Those costs are being covered by a $373,027 grant awarded in May by the Department of Community and Economic Development. Now, PennDOT has come through with a $1.4 million grant for construction of half of the project: from Pittsburgh Street west to Rebecca Street. The work will involve reconstructing sidewalks and curbs, and installing landscaping. Street lights that replicate old-style German lights will be installed. The first half of the project is to be under way in the second half of the year with finishing work in the first quarter of 2012, Mr. Rush said. Sometime early in 2012, he’s expecting to hear that PennDOT is coming through with the rest of the funding. The total project cost is estimated at $2.4 million. The second half of the project would start during the 2012 construction season. Mr. Rush predicted the job would be completed within a year’s time. He credits receipt of the grants to a partnership between the borough and the John Roebling’s Historic Saxonburg Society Inc., a nonprofit group that sponsors the Main Street program. The society is named for the town’s founder who invented wire cable and is famous for bridge design. One of his most notable projects was the Brooklyn Bridge in New York. Saxonburg’s Main Street is an official historic district on both state and national levels. 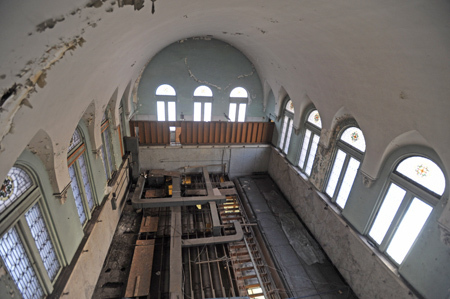 There are 52 historic buildings in the four-block project area, including Mr. Roebling’s home. A native of Germany, he designed the borough. Mr. Rush said the reconstruction project will maintain the borough’s historic look while modernizing the infrastructure. “It will bring the 1850s look into modern society,” he said. A history-loving physician has worked out a deal to save an 18th century home in Mercersburg. Dr. Paul Orange said today the William Smith House will be taken apart piece by piece over the next several weeks and reassembled on a new site elsewhere in the Franklin County community. The future of the building has been in question since the structure and land on which it stands were acquired two years ago by a local volunteer fire company. The MMP&W Fire Co., which has its headquarters and garages next door to the house on Main Street, bought the property for expansion and had announced plans to demolish the building. That news resulted in the creation of a citizens group, the Committee to Save the Justice William Smith House. Members say that events planned in the stone Ulster-style cottage in 1765 resulted in the earliest opposition to British rule in the American colonies and laid the groundwork for the Second Amendment to the U.S. Constitution. That amendment guarantees the right to bear arms. Dr. Orange, who has a family medical practice outside Chambersburg, estimated that the relocation project will cost as much as $250,000. He has agreed to fund at least $50,000 of that amount. The first steps involve removing 19th- and 20-century additions to the structure, carefully taking apart and numbering stones and timbers from the core of the building and arranging for storage nearby. That process is likely to take several weeks, he said. No decision has been made on where the house will be rebuilt. Several suitable properties are vacant along and near the borough’s Main Street. Mercersburg is about 150 miles southeast of Pittsburgh. When the British government failed to protect their homes and farms, residents of Pennsylvania’s Conococheague Valley gathered in 1765 at a house in what is now Mercersburg to organize themselves into a militia. That historic house may be demolished to make room for a volunteer fire company’s expansion, and some 21st century residents plan to gather this weekend to oppose that plan. Participants will gather at 8 a.m. today, Sunday and Monday in front of the property on Mercersburg’s Main Street. They will hand out fliers describing the building’s history and will outline efforts to rescue or relocate it. The house and land on which it stands belong to the MMP&W Fire Co., which acquired them in August 2009. The initials in its name stand for the Franklin County communities it serves: Mercersburg, Montgomery, Peters and Warren. They are about 150 miles southeast of Pittsburgh. The site is next to the fire company’s aging garage and headquarters. Fire officials have said they were interested in only the land. Plans to demolish the building, however, have been on hold since a Chambersburg physician came forward with a plan to relocate the house to a vacant lot across the street. That property had been occupied by a gas station. 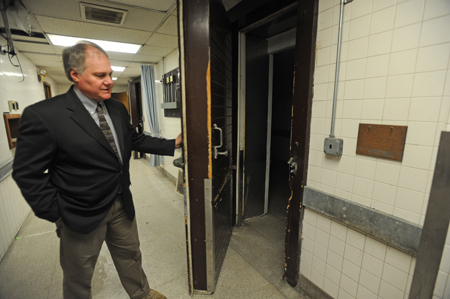 Dr. Paul Orange has said he was willing to cover the costs of moving the building if it will save it from demolition. Dr. Orange placed $10,000 in an escrow account as a show of good faith while sporadic talks have continued with the firefighters and the demolition firm. The parties, however, have been unable to come to an agreement. The relocation plan has support from Mercersburg Mayor James Zeger and some members of borough council. Dr. Orange said he was hoping to enlist their aid in setting up another meeting with the firefighters. Supporters of the house are worried, however, by signs of activity around the Smith house that they fear are preparations to start the demolition. A chain-link fence was put up Thursday. A spokesman for the fire company did not return calls seeking comment. William Smith was an 18th-century businessman and local magistrate. His home, originally a one-story stone cottage, has been altered and renovated extensively in the 250 years since it was built. His house was the meeting place for mostly Scotch-Irish settlers who armed and organized themselves into militia units. Their purpose was to protect themselves from raids by Native Americans who opposed white settlement in the region. William Smith’s brother-in-law, James Smith, took armed resistance one step further. Among the settlers’ complaints was that Philadelphia merchants were sending arms and ammunition to Fort Pitt, knowing that some of those weapons would be sold to hostile Native American warriors. Eight years before Bostonians dressed up like Indians to throw British tea into Boston Harbor, James Smith led disguised settlers in a raid on pack trains heading west. Smith’s “Black Boys” confiscated and destroyed supplies they thought might aid their Indian foes. When the British sent troops to nearby Fort Loudon to protect the traders, the soldiers found themselves surrounded and besieged by angry frontiersmen. Those actions, years before the Boston Tea Party, were the first shots of the American Revolution, Mr. McCown said. The activities of the frontier militia also laid the groundwork for the Second Amendment to the U.S. Constitution — the right to bear arms, he said.